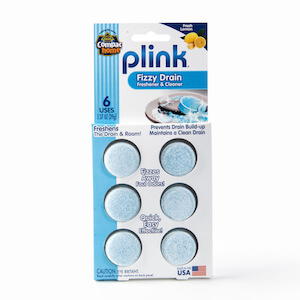 Plink's fizzy drain Freshener and cleaner keeps drains running smoothly by cleaning sink drains to prevent future clogs with regular use. 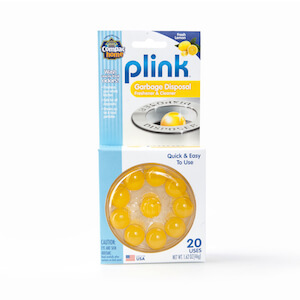 Special enzyme-based formula is designed to be powerful and effective to clean sink drain and pipes and freshen the whole room with a pleasant lemon scent. Whether it's the kitchen sink, bathroom sink, tub or shower drain, this specially formulated enzyme drain cleaner is the easiest way to clean and freshen drains, and prevent clogs! it contains no phosphates and is safe for drains and pipes. Regular use will keep drains open and flowing freely. It's plumbing and septic safe, too. Easy to use. Simply place a tablet beside, or on top of, the drain and run a bit of hot water over it. That's it! 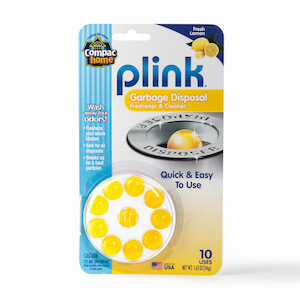 works in any household drain. Great for offices, boats and RVs, too. To maintain clear drains, use 1 tablet twice Weekly. Follow directions printed on the packaging. Made in USA.